A new type of heat map was introduced in the UK and it maps out, quite literally, the heating needs of the entire country. While designed to help implement heating infrastructure like district heat plants, the map is also a very useful tool in seeing how energy usage, right down to the neighborhood, can be visualized. Developed for the Department of Energy & Climate Change (what a refreshingly honest name) the map’s accuracy is based on individual buildings — but the designers promises the data does not compromise privacy. 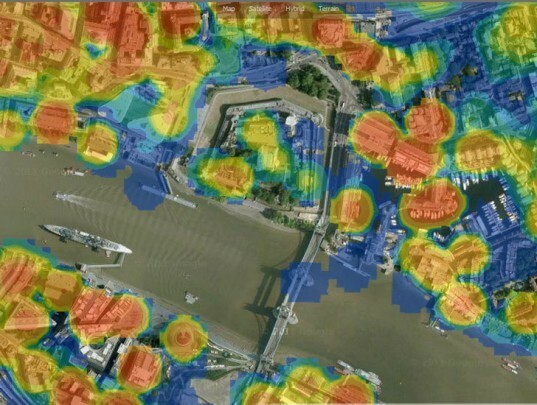 The National Heat Map designed by the Centre for Sustainable Energy is built on data from individual homes, public and private buildings, and industrial buildings. When zoomed out, the red blobs give a clear indication of England’s BTU consumption. Zoom in and a vast swath of individual blobs emerge, indicating the energy use of all buildings. The tool can break down to indicate each of the four primary building types, and pin-points Thermal Heat Plants and CHP or Combined Heat and Power Plants throughout the country. The data set is extremely useful in developing centralized heat plant operations, which when producing electricity, is one of the most efficient known ways to deliver conventional energy. Local governments can make the best use of planning infrastructure while saving time and money in data collection. For the rest of Britons, the maps gives a fresh way to look at how they stack up in the neighborhood. The map gathered data “for both residential and non-residential models, [in which] heat demand was first estimated at address level using a range of data sources. These estimates were then used in a weighted disaggregation of known small-area average heating fuel consumption.” The true accuracy of the map per building is difficult to establish, but it does protect residences from feeling that their privacy is being invaded. A new type of heat map was introduced in the UK and it maps out, quite literally, the heating needs of the entire country. While designed to help implement heating infrastructure like district heat plants, the map is also a very useful tool in seeing how energy usage, right down to the neighborhood, can be visualized. Developed for the Department of Energy & Climate Change (what a refreshingly honest name) the map’s accuracy is based on individual buildings -- but the designers promises the data does not compromise privacy.